Inspired by the stunning red rock formations we enjoy around Colorado Springs, and of course our founder Red Noland, Red Noland Pre-Owned is proud to create RedRox Jeeps for our customers! These RedRox Jeep Wranglers are upgraded and customized with industry leading parts and accessories to create the ultimate off-road machine. We have recently completed a build that you won’t want to miss out on! Building on an already cool automobile, our experts at Red Noland Pre-Owned upgraded this 2018 Jeep Wrangler Unlimited JK Rubicon to be a machine that will climb just about anything! This beautiful Jeep is loaded with over $10,000 of premium parts including a 4-inch Mopar lift kit with Fox reservoir shocks, Smittybuilt synthetic rope winch, 35-inch Fuel wheels with Falken tires, flat aluminum flares, and much more! An extensive suite of amenities make this amazing Jeep a comfortable daily driver. Enjoy heated leather-trimmed front bucket seats, an Alpine 9-speaker sound system with all-weather subwoofer, Max Tow Package with Class II receiver hitch and 4-pin connector, GPS navigation, 7-inch Uconnect infotainment system with voice command, 5-year SiriusXM Travel Link service, and much more! 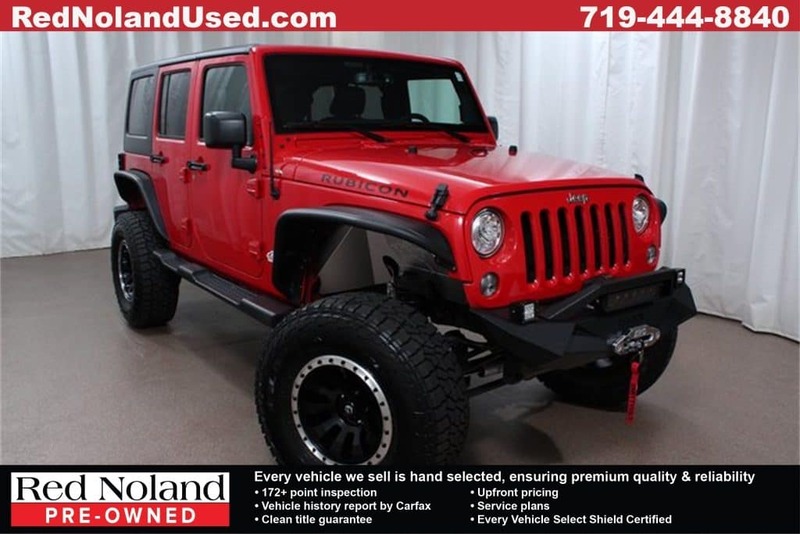 Stop in to Red Noland Pre-Owned in Colorado Springs today see this beautiful used 2018 Jeep Wrangler Unlimited JK Rubicon RedRox build!